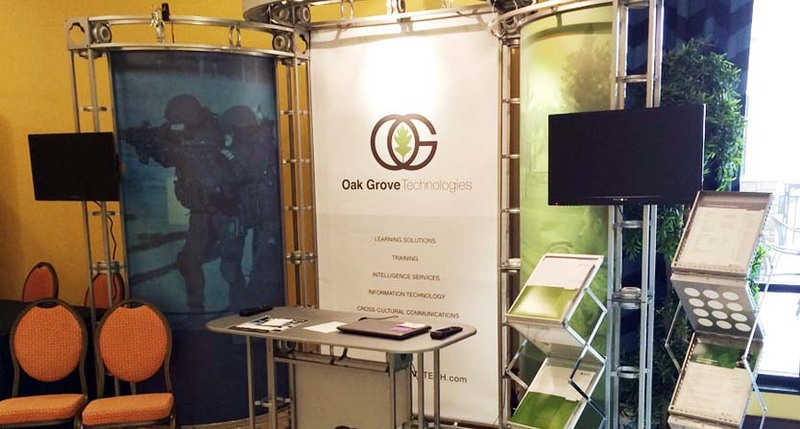 Your trade show display is the first impression you make on a prospective client. Make it a good one with eye-catching collapsible Pop Up displays, tension fabric displays or table top displays! 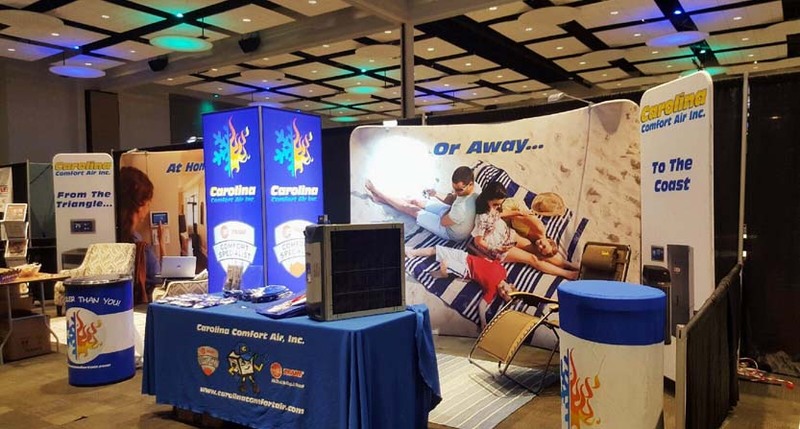 Customize your trade show booth with high-impact retractable banner stands or backdrop banners that are sure to get you noticed. 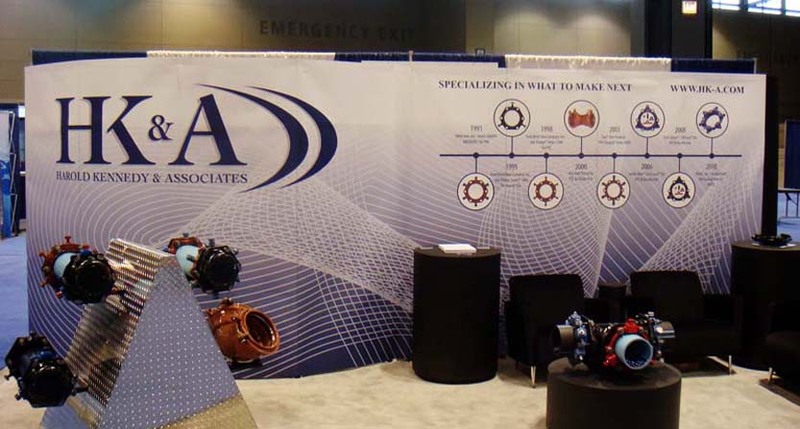 We specialize in creating attention-grabbing trade show graphics and displays that are lightweight, durable, and easy to assemble. Make an impact with eye-catching, portable display stands. 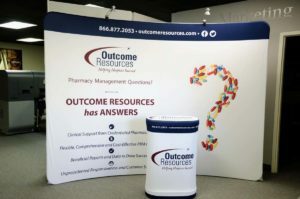 Custom Pop Up trade show displays are an excellent choice for nearly all trade shows and conventions, tailored to fit every customer’s unique needs. Our portable displays are the most convenient trade show displays on the market because they are lightweight and easy to assemble. We offer a variety of display sizes and styles with customizable graphic backdrops. Pop Up display graphics are easy to replace, with many accessory options available. 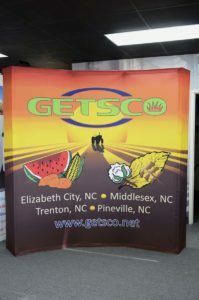 Save time and money at your next trade show event with custom tension fabric graphics. Tension fabric displays provide an affordable option, and their design makes for simple storage. They are quickly assembled in just 5 minutes! Simply slide the tubes together to make the frame and lock in place with a push button snap. Then just pull the pillowcase-like graphic over the frame and zip it shut. Make the most out of a limited amount of space with table top graphics and displays! Table top trade show displays are perfect for exhibits and presentations. They feature a sturdy, yet lightweight, aluminum construction that offers easy set up and travel. All of our table top displays offer a professional and affordable solution for any need and budget. Sometimes you need big impact in a small space. 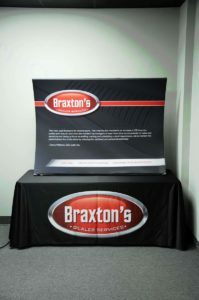 Increase your visibility in an affordable way with custom retractable banner stands. Build brand awareness, communicate marketing points and highlight contact information, while maintaining a professional appearance. 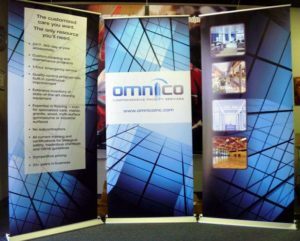 Create a background for your next trade show display with a quickwall, or a series of retractable and collapsible banner stands. Quickwalls are capable of accommodating graphics of varying widths and heights to maximize the impression you make on your customers. Click here to see our large selection of banner stands. Step-and-repeat banners are a versatile backdrop display option for a wide variety of occasions. They are essential for any special event, grand opening or conference. When used as photo backdrops, these displays serve double duty. 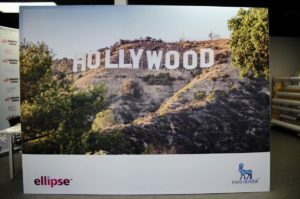 Not only do they create traffic at your exhibit, but they also expand your reach outside of the event, as the photos taken are often circulated on social media. Turn a simple table into branded marketing material using our custom table throws and runners. Table throws are an ideal addition for any trade show, convention or business event display. Throws and runners are specifically suited for 6′ or 8′ wide tables. SpeedPro Imaging NW Raleigh is your source for custom trade show displays in Raleigh, Durham, RTP and Cary. We are conveniently located just 1 mile from I40 and Aviation Parkway in Morrisville, NC. Call today to schedule a consultation and see how you can transform your space.